The Intelligence Advanced Research Projects Activity and the National Institute of Standards and Technology have invited academic and industry researchers worldwide to develop algorithms for retrieval of cross-lingual information through a $30K prize competition. 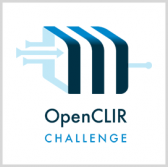 IARPA said the OpenCLIR Challenge seeks technology that will work to help English speakers to identify content from blogs, social media, speeches, newswire and broadcasts to address information needs in computationally underserved or lower resourced human languages. The contest is derived from IARPA’s Machine Translation for English Retrieval of Information in Any Language program that included domain classification and summarization tasks, additional languages and query types. Interested parties can register to join the challenge via NIST’s website. The deadline to submit algorithms is Feb. 1 and the announcement of winners will happen on May 15.